Overwatch Torbjorn Costume Uses a Wig for a Beard « Adafruit Industries – Makers, hackers, artists, designers and engineers! Honestly it was a Matilda from Arda Wigs turned upside down so the lace was against my face. I styled it that way, and sewed an elastic band onto the back to go over my head like a headband. I’m glad I didn’t glue it down like i was originally planning, the only saving grace of it was being able to remove it to get some fresh air. Whole wigs aren’t only for heads. As long as you’re wearing a helmet or some sort of accessory to cover your head and the elastic band, this is a great idea if your cosplay includes a lengthy beard. 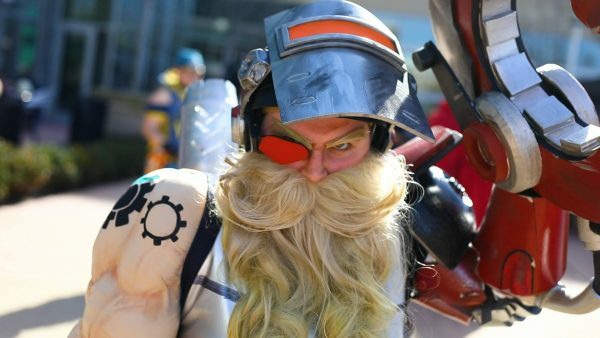 You can see Torbjorn and other cosplayers from Katsucon 2017 in this video by Blake Faucette of Distractotron.